Moggill belongs to the Brisbane City ward of Pullenvale, to the Queensland electorate of Moggill and to the Federal electorate of Ryan. Moggill was settled early in the establishment of the colony of Brisbane because of its position on the Brisbane River. At various times wood-felling, farming and mining activity took place in the area and more recently the Moggill Pocket was subdivided into acreages. Long-standing residents have told us that on many occasions a bridge was promised to replace the Moggill Ferry but it never eventuated. 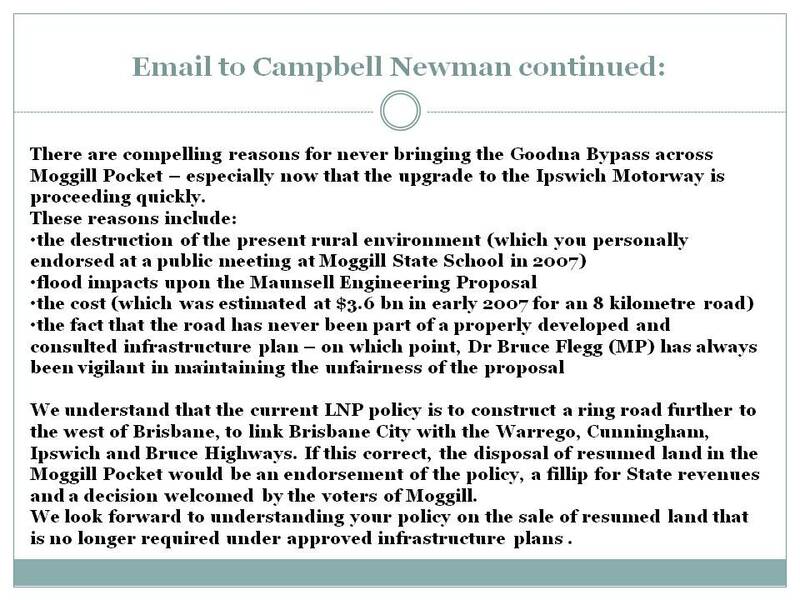 In 2004 four options for a bypass across the Moggill Pocket were proposed. 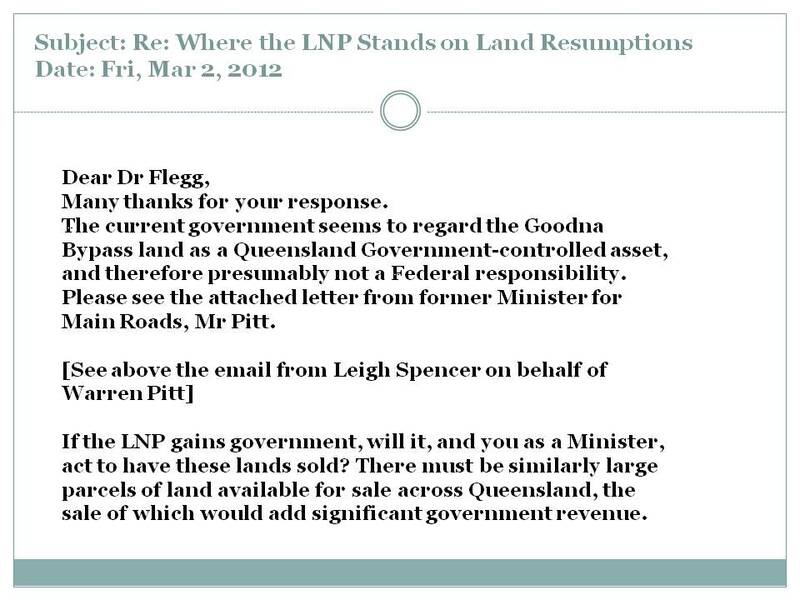 [This also applied to Priors Pocket which is part of the Moggill suburb.] Virtually all the residents in this vicinity viewed this development as a threat to the community rather than as a positive proposal. Once again the plan was shelved when a different political government came to office in 2007. However Brisbane referdexes and GPS systems still show dotted lines for the proposal even though the 2011 flood seriously undermines the idea of bridges and a cutting in that location. While this mapping remains, real estate values are compromised. Rural Environmental Planning Association Inc. The aim of REPA Inc. is to contribute positively to the planning process in ways which will preserve the rural amenity of the district which now comprises the major part of the Pullenvale Ward. REPA Inc. is a community-based planning association which has been active in the Brookfield-Pullenvale- Moggill area, and adjoining rural suburbs, since 1973. 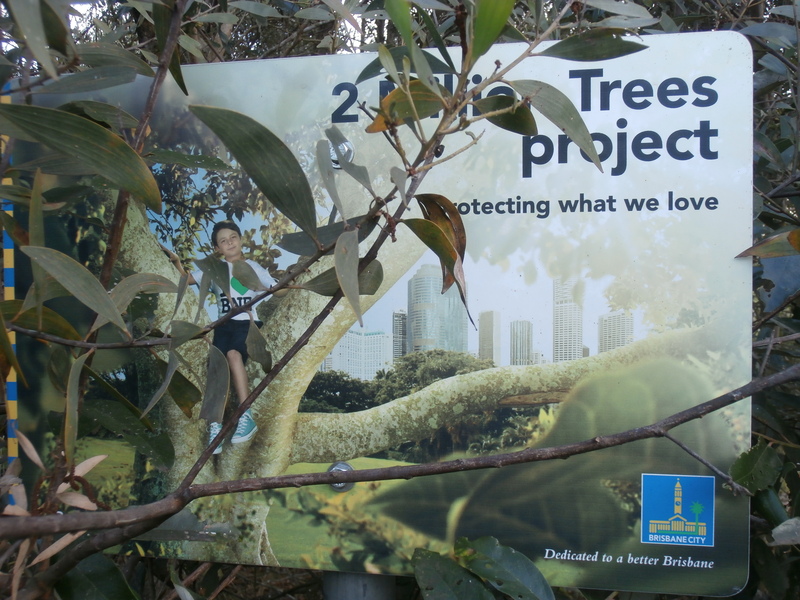 REPA operates for the long-term benefit of local residents and the balanced development of the City of Brisbane and also participates in local environmental community projects. We are grateful that REPA objected to the 4 options for a bypass in 2004 – http://www.repa.org.au/maunsellsubmission.pdf – on behalf of residents and in the future we may again need to ask this association to represent the Moggill Pocket and the wider community if further developments are proposed. The Council have been instrumental in helping us with our Land For Wildlife status. See the Land for Wildlife page subsidiary to Wildlife page on menu. 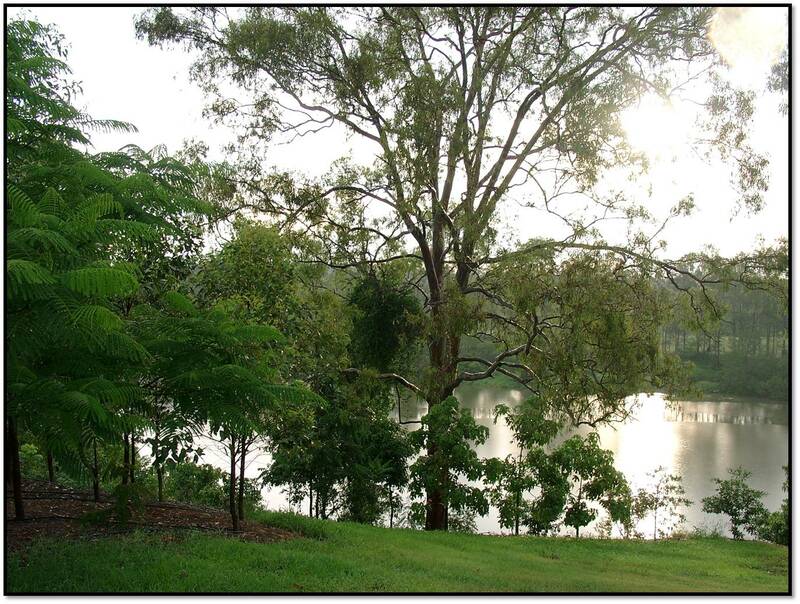 The Council also is responsible for the 2 Million Trees Project, the Moggill Rd Wetlands and the Moggill Ferry Park. 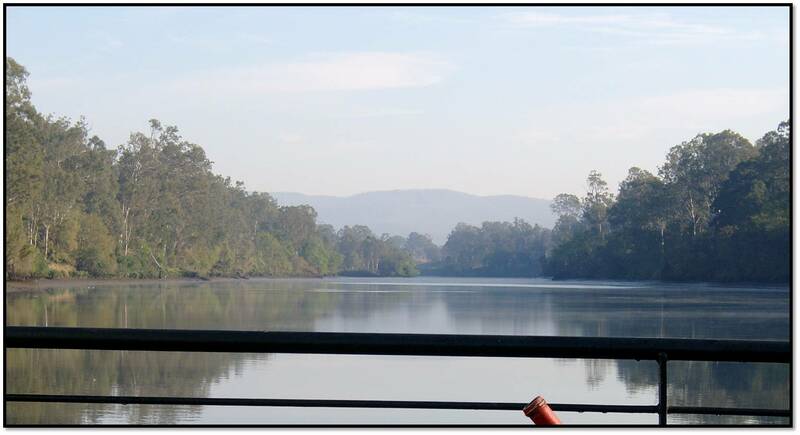 Currently (2012-2013) the Council is consulting the community about developments for the Moggill and Bellbowrie district. The wetlands along from us on Moggill Rd. is performing a significant part in encouraging various colonies of different types of birds, some of which visit our place as well as nearby properties which also have dams. The area has become a place of beauty and an important breeding site for many different species of birds which you can more fully appreciate by looking at some exquisite photos taken by a local photographer, Vera Harper. 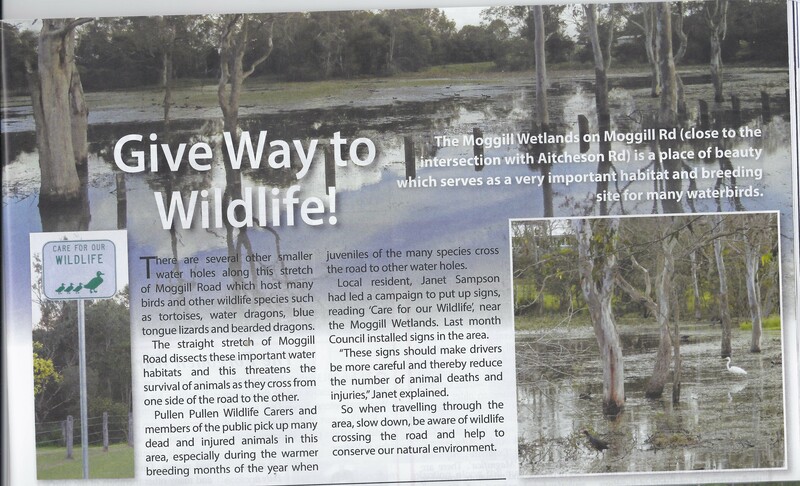 A successful petition was raised in July 2013 asking the Main Roads Dept to erect wildlife protection signs along Moggill Rd near the wetlands. This was featured on page 31 of the August edition of the Local Bulletin. 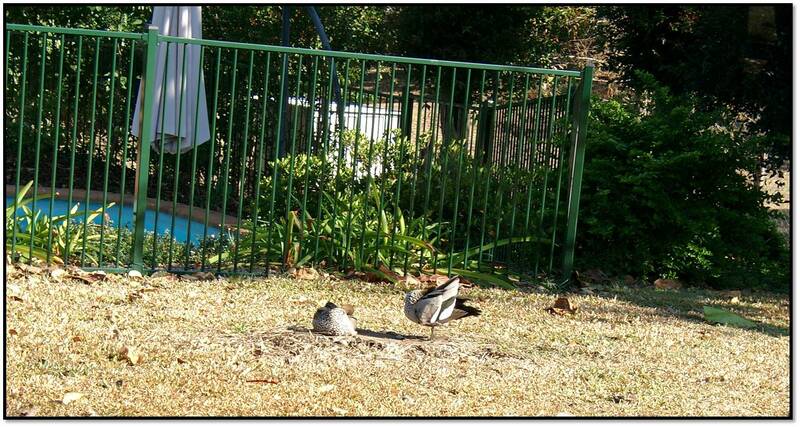 During the drought and before the wetlands was re-established (with a large planting of natives), some of the ducks resorted to using our swimming pool and forced us to be vigilant at cleaning up after their visits. Unfortunately virtually all the plants that had been placed in the park near the ferry (as part of the 2 Million Trees Project) were swept away during the flood – so also was an historic section of the old ferry that used to ply cars across the river. After the 2011 flood the park was re-sculpted and a new playground and new plants were included (not the same amount as previous to the flood). It was a wonderful to see a selection of hoop pines, fig trees and gums as well as a BBQ in the Council’s park restoration. Unfortunately, even though the flood in 2013 was only half the height of the devastating 2011 flood, this riverbank park was completely submerged again. 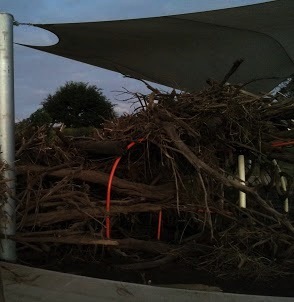 Many of the trees were able to be pulled upright again but the following photo shows the wreckage of the playground and it does not seem wise with rate-payer’s money to re-build any such structure on the site again. 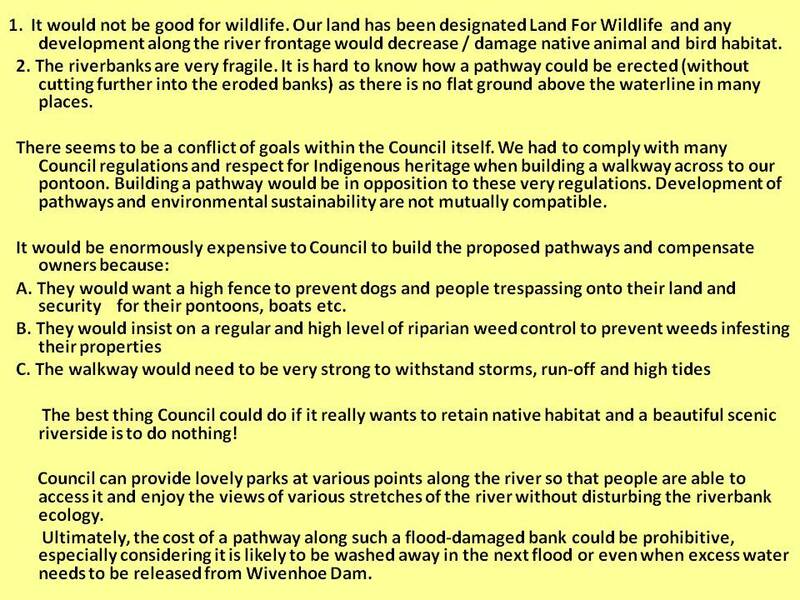 On Friday, 18 March 2011, I sent the following email submission to neighbourhood_planning@brisbane.qld.gov.au, objecting to the long term plan to have pathways running along the river between Anstead Park and the Moggill Ferry. 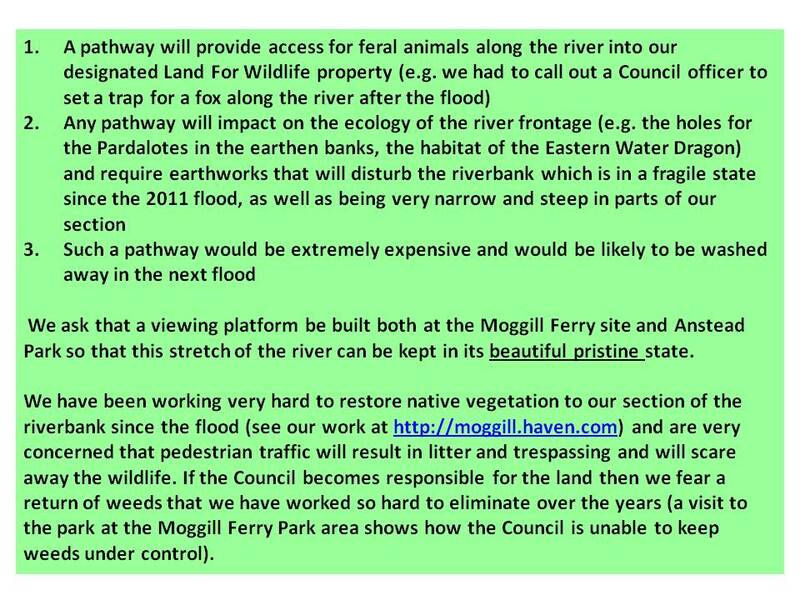 The latest draft proposal of the Moggill Bellbowrie Neighbourhood Plan (which was released in June 2012), still ‘requires the dedication of riverfront land to Council with connections to nearby public spaces and roads.’ So on the 19th July we have again submitted the following objection to the Council’s long-term goal of acquiring river frontage for a public pathway between the Moggill Ferry Park and Anstead Park. 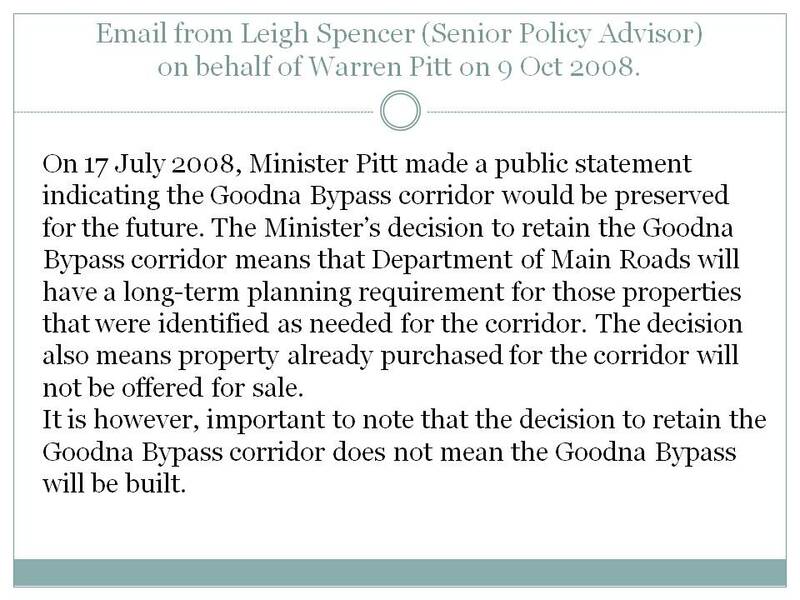 Early in 2007 the Federal Liberal Party announced that a particular option requiring 4 bridges for a bypass of Goodna (2 for the Moggill Pocket and 2 for Priors Pocket) would be built. This bypass would cut across the Moggill Pocket (through the property to the north of ours) and Priors Pocket to relieve traffic congestion on the Ipswich Motorway. 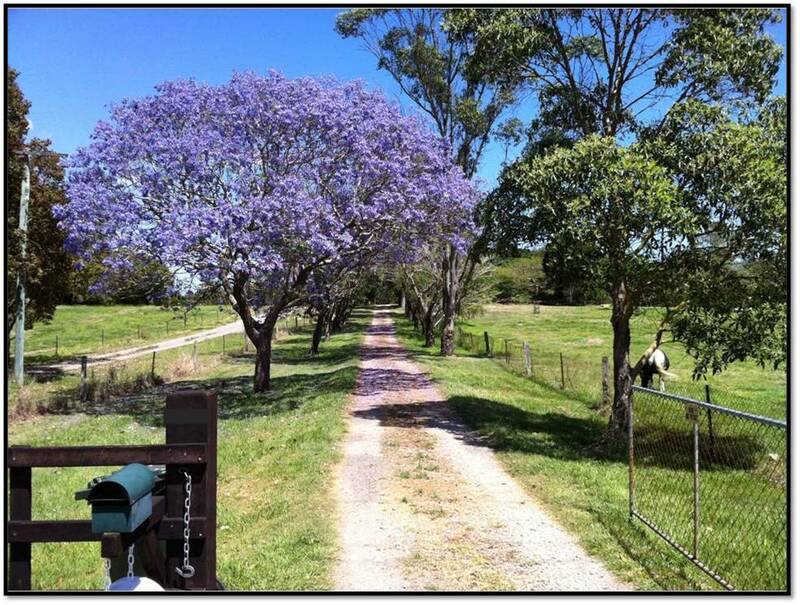 The Moggill Community banded together in opposition to the Bypass. 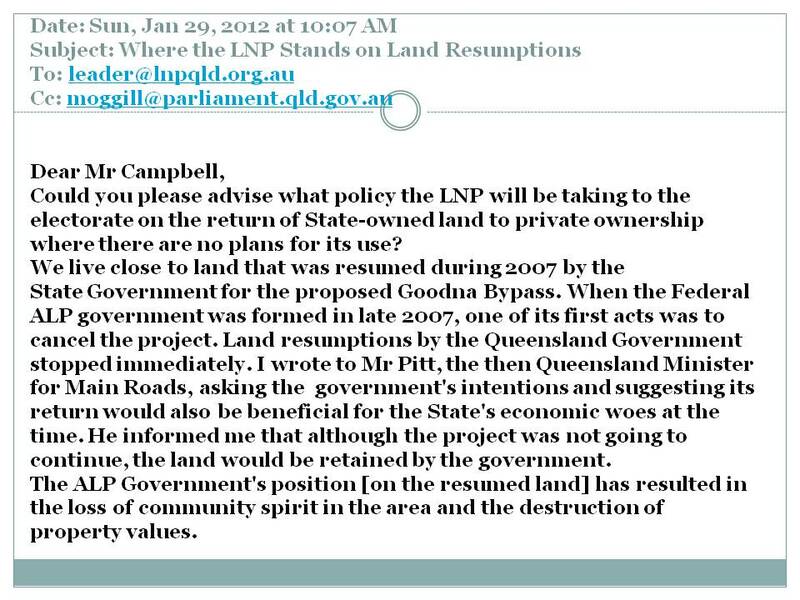 We are grateful for how Margaret de Wit (Local Brisbane City Councillor – Liberal) as well as Campbell Newman (then Mayor of Brisbane – Liberal) and Dr Bruce Flegg (State Liberal representative) assisted the community in protesting against the proposal and its unfairness to the landholders who had no prior legal notification when they purchased property in this area. It appeared that any arguments against the bypass on environmental grounds would go unheeded. We joined with other community members in protesting the proposal publicly and we ourselves also made several appeals to the State Government because the Bypass was to be constructed as a joint State and Federal venture. The Goodna Bypass went off the agenda when the Federal Labour Party led by Kevin Rudd was elected in October, 2007. Instead the Federal Government set about upgrading the Ipswich Motorway (and in July 2012 it is nearing completion). 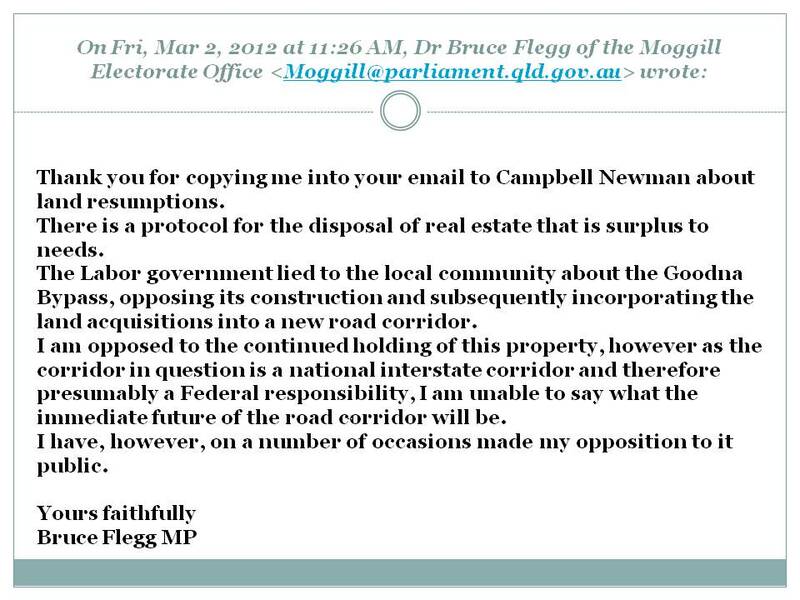 In the light of this Ian sent an email before 2012 State election to Campbell Newman requesting that land which was resumed for Goodna Bypass be given back. I have sent a request to the Department of Main Roads and Transport on 20th August, 2012 asking that mapping lines for the bypass be removed from Brisbane referdexes and GPS systems. 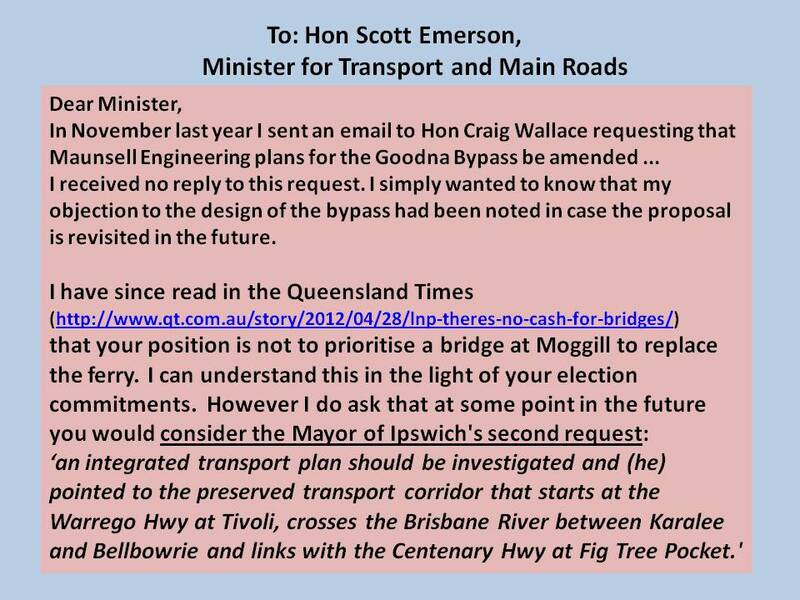 On 30 November 2011 I sent an email to former State Minister for Main Roads, Hon Craig Wallace (mainroads@ministerial.qld.gov.au) advising that the Goodna Bypass would have been a disaster during the 2011 flood as the bypass was to be CUT through the land across the Moggill pocket. If it had been constructed before the flood, the Brisbane River would have rushed through the cutting and caused substantial erosion of the land as well as destruction of the bridge and the road. I did not receive a reply to this email and so on the 28th April 2012 I sent another email along similar lines to the new minister asking that he liaise with the Mayor of Ipswich.